This Murphy Paint Company sign measures 24″ by 34″ and is in a strange die cut shape. The shape appears to be a small rectangle centered at the bottom of a larger rectangle with cut corners. At the top of the larger rectangle is a skinny rectangle that runs the length of the large rectangle. 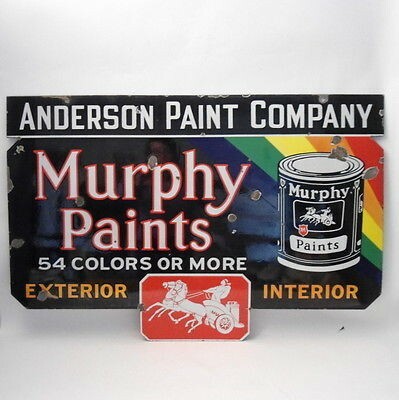 The sign text reads “Anderson Paint Company, Murphy Paints 54 Colors or More, Exterior Interior.” The right side of the sign shows a paint can while the bottom portion of the sign shows a man in a chariot.